Fall is definitely my favorite season when it comes to cocktails. It's the perfect time for spirit-forward drinks with flavors of smoke and spices. I usually reach for whiskey in the fall, but aged tequila can be a perfect spirit for the season, especially when paired with a bit of smoky mezcal. For this cocktail, I used an anejo tequila aged in bourbon barrels to bring in those same smooth vanilla and caramel notes that a whiskey might have. 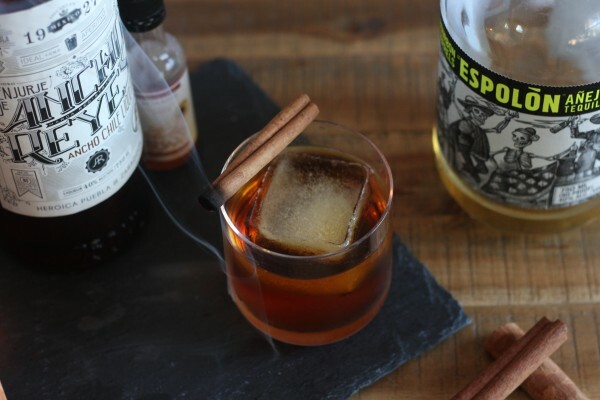 A bit of Allspice Dram or Sukkah Hill Spirits Besamim add some autumn spices, and Ancho Reyes provides a surprising, spicy kick. Some Punt e Mes brings it all together. When you try it, you first get a touch of sweetness and flavors of cloves, vanilla, and cinnamon. It drinks like a bourbon cocktail for a split second. Then the mezcal and Ancho Reyes hit you with smoke and spice at the end of your sip. I can't imagine anything more perfect for a chilly fall day. One of these will warm you right up. Combine all ingredients in a mixing glass with ice and stir until chilled. Strain into an Old Fashioned glass with one large ice cube. Garnish with a burnt cinnamon stick. Katie Stryjewski is an evolutionary biologist by day and cocktail blogger by night. She started her blog, Garnish, to learn more about spirits and cocktails and keep track of great recipes. Garnish is all about making craft cocktails more accessible to everyone!